HomeThe Astonishing Revelations of Wayne Madsen on the Mystery Explosions in China and Japan. The Astonishing Revelations of Wayne Madsen on the Mystery Explosions in China and Japan. Aftermath of the covert nuclear attack on Tianjin, China of August 12th, 2015. Wayne Madsen, a highly credible source has provided a coherent and plausible account of the series of mysterious explosions that have struck both China and Japan in recent months along with others others that I was unaware of, such as the explosion in recent months in Los Angeles on August 21st..
Much of Wayne Madsen’s work is posted beyond the paywall at Wayne Madsen Report at places such as Intrepid Report, but the pieces on the recent events in China and Japan appear not to have made it and as a result did not have the impact they deserved. This is simply a retelling of what Madsen has written in a series of articles on this subject. October 1-2, 2015 — Explosions in China are no longer reported as “accidents” but as sabotage – Wayne Madsen Report. It is not possible to confirm this account of events but I have checked Madsen’s narrative and it fits with the known facts. With these type of stories the way I tend to regard it is This may not necessarily be entirely correct but it is an opinion held by well informed sources within intelligence agencies and represents at the very least a step towards understanding what is happening. This is a quick summary of the conclusions Madsen makes. The Explosions that have taken place in China in recent months were due to sabotage. 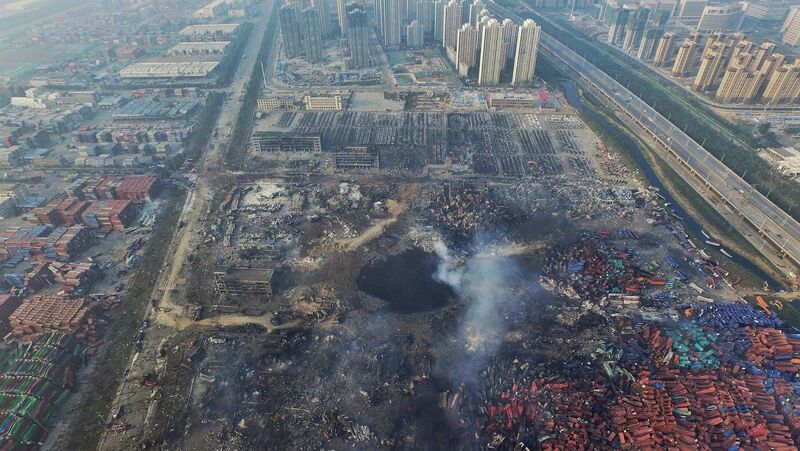 The Tianjin blast was caused by a Nuclear device. These can be regarded as confirmed. Because the Japanese military have been forbidden from building offensive capabilities by the Japanese constitution imposed after World War 2, nationalist Japanese politicians such as Shinzo Abe used cut-outs to conduct offensive operations and build offensive capabilities. One of the cut outs they used were the Aum Shinrikyo cult notorious for the Tokyo subway Sarin gas attack of 1995.
in the early 1990s the Aum Shinrikyo cult purchased a large remote property in Western Australia the Banjawarn Station, on May 28th, 1993 it appears the group detonated a nuclear weapon on the half a million acre property, whether the detonation was the result of a test or an accident is unclear. All of the details of this incredible sounding tale stand up to scrutiny, to the point where the matter was reported upon in the New York Times and discussed in the Western Australian Parliament. The Aum Shinrikyo were an international group, their leadership was in Japan but the largest membership was based in Russia. It is claimed that the Aum Shinrikyo sought information about nuclear weapons from Russian members with connections to the Russian nuclear weapons industry. In the years after the Tokyo Sarin attack, the Aum Shinrikyo came under intense pressure. In the year 2000 the Aum Shinrikyo group split between a group who morphed into a Scientology type non- violent cult whilst the remaining doomsday adherents formed a group called Aleph. Aleph is also the first letter of the Hebrew alphabet. I have searched for information on this group but very little detail is available beyond confirmation of the basic fact that they exist, they have sued for libel successfully and little more. None of the above sources are particularly illuminating but they are all that appears to be available. North Korea and the Chinese snub. One very interesting thing that Madsen noticed that everyone else seems to have missed is that North Korea was severely snubbed in the Chinese celebrations of the 70th anniversary of the end of the Second World War. Whilst the distant leader Robert Mugabe of Zimbabwe was welcomed, the Chinese only invited the Foreign Minister of North Korea Kim Jong un the “Supreme Leader” and third generation of the Kim dynasty was not invited. One of the really interesting things about Kim Jong un is that his Godfather is an extremely notorious Chinese Secret Police Chiefn named Zhou Yongkang who is part of the faction that is currently being purged by the Xi faction. So an extremely complex picture seems to emerge of a multi-layered factional war inside China, Japan and the US with elements in Japan China and North Korea in a dark and covert alliance against the current ruling faction in China who appear themselves to be capable of high deception and ruthless violence. According to Wayne Madsen all of the explosions at the Chinese industrial sites were acts of espionage that he alleges are connected to the Aleph group or similar rogue Japanese elements who function he claims as an arm of the Japanese deep state similar to the Gladio groups in Europe in the distant and recent past. Madsen claims that the Tianjin blast was caused by a nuclear weapon in a shipping container and that the Lijin blast, both the blasts in Shandong, in August and the explosion in Dongying in September were all caused by acts of sabotage and that the Chinese are completely aware they are under attack. In addition to those astonishing claims Madsen claims that it appears two at least two incidents were part of a Chinese response to the acts of sabotage against them. The Los Angeles Explosion of August 21st, 2015. On August 21st, a generator exploded in Los Angeles causing power outages in an area choked with key US data infrastructure. Four people were injured in the little reported incident. “At least one data center has experienced disruptions following an explosion in a basement of a high-rise in downtown Los Angeles Thursday evening. While the cause of the explosion is still being investigated, the Los Angeles Fire Department suspects it had something to do with a generator in the basement. The blast at 811 West Wilshire Blvd. took out an on-site power station, leaving 12 buildings in the area without electricity, according to the local utility. The explosion interrupted connectivity on network infrastructure operated by Level 3 Communications, which serves a lot of data center users in the area, Craig VerColen, a spokesman for LogMeIn, a company whose data center went dark as a result of the incident, said via email. Level 3 issued a statement saying its technicians were working to restore services. The US Military Depot Explosion in Japan. Madsen also tentatively attributes the explosion at the US Military depot in Japan to Chinese elements who apparently blame elements of both the US and Japan for the incidents of sabotage and suggests that the explosion at the Japanese aluminium factory may also have been the result of the same type of action. The Spate of Liucheng Explosions. China Hit by Wave of Mystery Blasts. Madsen attributes the dozens of explosions in Liuecheng Southern China to a different but related source. Madsen claims that US intelligence agencies have co-opted Chinese Muslim Uigars and are inserting them into southern China in order to conduct acts of sabotage and the spate of explosions last week are attributed to these proxy militants. It cannot be stated with confidence that the narrative presented by Wayne Madsen is completely correct but it appears to be a coherent narrative. It makes sense and fits with the known facts and at the very least is worth bearing in mind the next time news breaks of the inevitable next unexplained explosion in North Asia. China Uncensored is a very poorly disguised CIA front, but their work is not without merit on occasion..
← Syria Launches Russian Backed Ground Offensive. This is absolutely fascinating stuff and top-class blogging/journalism. Great work, James. Many thanks Burning Blogger of Bedlam, I hope I made it clear that the credit for the story belongs to Wayne Madsen. What’s to keep any nation from shipping a nuclear bomb on a container ship into any US port and destroying the city? Or vice versa? A very good question BigTim, deterrence, the threat of being made to pay for it, is a powerful disincentive and they also have sensors that are able to detect the presence of nuclear weapons in sensitive areas. My understanding is that part of what was used to demolish the World Trade Centre in 2001 were underground nuclear detonations so the system may already have failed. Thanks for comment. I think the 9-11 nuke theory was debunked? Veterans Today got into some controversy a while back when one of their writers apparently was a fraud. ‘9-11’ was an inside job tho. Thermite and those charges is what brought the buildings down. Thanks for that J Dixon. The precise means that were used to destroy the towers is a secondary issue but I would have to respectfully disagree with your assessment regarding nuclear weapons. Veteran’s Today may have been mistaken to claim that nuclear weapons alone destroyed the towers but the evidence of a nuclear event is compelling. My understanding is that a combination of incendiaries and explosives were used but in my opinion the core was taken out by an underground nuclear detonation. As far as Veterans Today goes, I would suggest that you view the site and judge for yourself but I think you may have the wrong end of the stick there. Thanks for comment.